Whether it's a truck full of truss or a single esoteric piece of hardware, FP Logistics has the rigging equipment you need to get your production working perfectly! 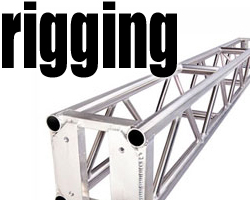 Truss: Truss is a very lightweight and transportable solution to your heavy duty rigging and suspension needs! FP Logistics has the variety and depth of inventory for all your trussing needs! Pipe: Steel and aluminum pipe structures are convenient and cost effective solutions for mounting smaller quantities of fixtures. Find the pipe and accessories you need at FP Logistics today! Slings & Webbing: Slings and webbing are a very convenient way to strap items together or hang them from other points. At FP Logistics, you'll find a wide selection of slings and webbing for all your rigging needs! Hardware: Having the right hardware to go with your rigging supplies means the world. At FP Logistics, you'll find a wide variety of hardware specifically built for your rigging needs! Counterweight: Counterweight is an absolute necessity when it comes to stabilizing your structures. Whether it's drums, sand or shot, FP Logistics has the counterweight you need for all your rental demands!